Deal Me in Week #4: "The Hands of Mr. Ottermole"
Deal Me In Week #3: "Death Draws a Triangle"
Deal Me In Week #2: "How We Lost the Moon"
2016 Vintage Scavenger Hunt Winners! 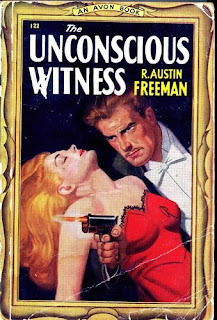 Unconscious Witness (1942) by R. Austin Freeman is the 28th entry in the Dr. Thorndyke series. It involves an artist who is out sketching and manages to see the beginnings of a rather involved crime. Little does Tom Pedley know when two men walk past his hidden sketching spot (he can see them, but they can't see him) and a woman comes sneaking along behind them that his impressions and a quick sketch drawn afterward will help Dr. Thorndyke unravel two murders and solve the disappearance of a woman by the name of Mrs. Schiller. 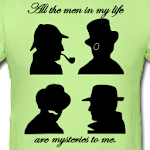 Of the two men, one is Charles Montagu and he will not return from the walk in the woods. When Montagu is found dead, authorities know that there was an artist in the vicinity, but are unable to trace him immediately. 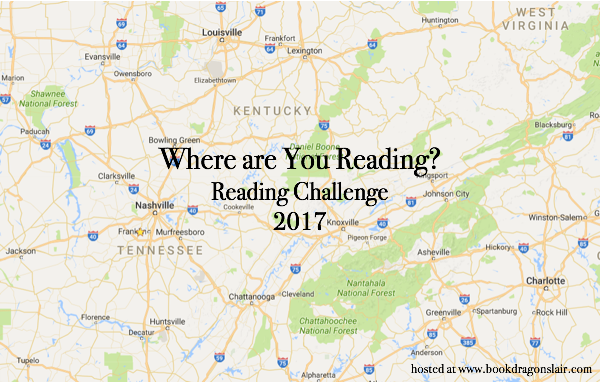 Pedley doesn't own a wireless and rarely looks at a newspaper, so he finds out about the murder just before the police track him down. Since he's known to Mr. Polton, an associate of Dr. Thorndyke's, the police are more willing to accept his reasons for not coming forward than they might otherwise be--but his detailed description of the events of that day and even his sketch of the people involved give the police little help in unraveling the mystery. It isn't until another artist, Lotta Schiller, takes up residence in a house nearby, makes his acquaintance and then disappears that his evidence proves more useful. And when the body of woman who has gone under the name Emma Robey is found in Mrs. Schiller's abandoned rooms things get really complicated--found most providentially by Mr. Polton which brings Dr. Thorndyke into the case. Dr. Thorndyke's sharp eye sees what the police and even Pedley with his artist's eye for detail have missed. This counts for the "Hand Holding Weapon" category on the Golden Vintage Scavenger Hunt card. And...just so you know, that scene on the cover of my Avon edition pictured above never happened in the book. 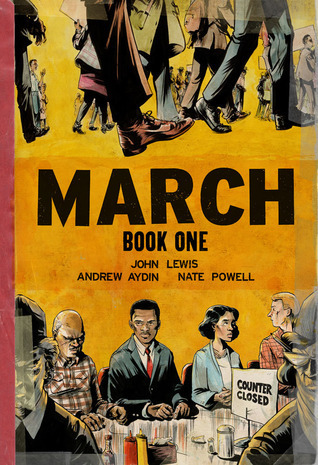 The series of books titled March (Books One, Two & Three) by Representative John Lewis tells the story of his early life in Alabama and the journey that took him from his parents' sharecropper farm through the Civil Rights movement of the 1960s to the halls of Congress. Framing Lewis's story is the inauguration of Barack Obama, America's first African American President. It is a powerful story that is much needed in the current American climate--a reminder of where we have come from as a nation and what too many of our citizen's have had to go through, as well as providing a reason to pledge that we not go back. counter sit-ins. We see his willingness to go to jail for the cause he believed in and his growing dedication to the cause. 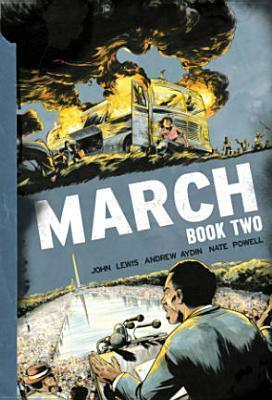 Book Two continues the journey with the movement progressing from lunch counter protests to the Freedom Riders boarding buses to the deep south and the heart of racial hatred. The Freedom Riders face beatings, more imprisonment, and even a bus explosion. But their efforts are not in vain--the Riders get the attention of Martin Luther King and Attorney General Robert Kennedy and Lewis continues to move to the forefront of the group's leaders. This volume ends just after the March on Washington. Lewis has become one of the Big Six, giving his powerful speech just before King's "I Have a Dream." 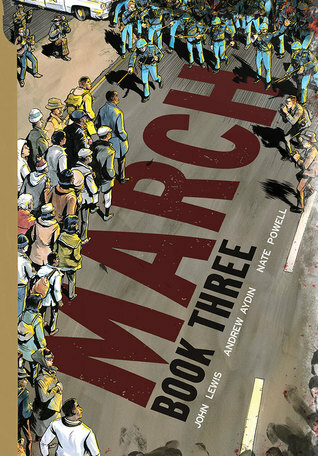 Book Three follows Lewis and the Student Nonviolent Coordinating Committee through efforts to secure voter registrations for all adults--especially in the South where black men and women are, when allowed into the courthouse to try and register, given unfair "literacy tests" to prove their ability to vote. They continue to protest and march, facing blatant injustice, legal tricks, intimidation, violence....and for some, even death. After JFK's assassination, President Johnson pushes for Congress to move on and pass the Civil Rights Bill for which Kennedy had fought. But the bill helps little when no one forces Southern states to follow through on it. Eveything pushes Lewis and his fellow activists towards the historic showdown and march from Selma to Montgomery. This is my first year participating in Jay's Deal Me In Challenge . In a nutshell--we line up 52 short stories for the year, we match those stories up to a card in a regular deck of card, and each week we shuffle our deck (of real cards) and draw a card from whatever remains in the deck. 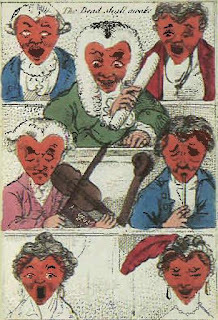 Week #4 gives me the Seven of Hearts which matches up to "The Hands of Mr. Ottermole" by Thomas Burke. The Burke story appears in Murder by Experts edited by Ellery Queen and was first published in A Tea-shop in Limehouse in 1931. 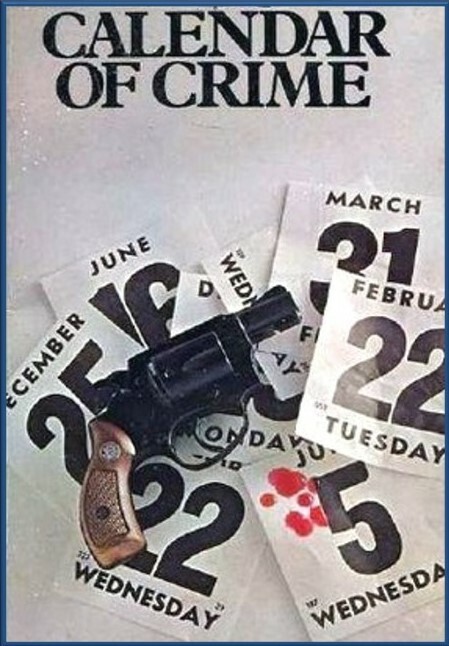 When Ellery Queen included the story in 101 Years' Entertainment, it was introduced with a simply sentenc: "No finer crime story has ever been written, period." The story is quite remarkable. Burke manages to tell a fine tale of a serial killer who gets away with murder in a story of just 17 pages or so. In shortened form, you would expect to find less tension and less room for the true horror of multiple killings. After all, the author can't build things up and taunt the reader with victim after victim. And he can't spend a lot of time letting you become attached to the victims as they're casually strangled one by one. The power of Burke's story is in the fact that, although we don't know these people well, he makes us realize that any of these unfortunate people could be us. It's the average Londoner who is slain with no rhyme or reason--other than the idea just occurred to the killer. It is also a particularly affecting story because, for those who are encountering it for the first time, Burke manages to parade the killer around quite openly without giving him or her away. 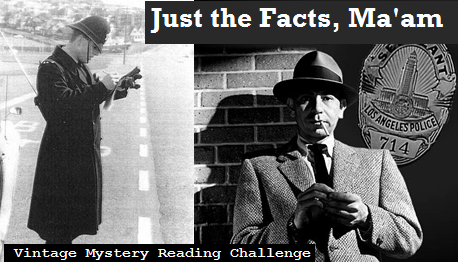 It will be a sharp reader indeed who spots the murderer before the surprise at the end. Amah (the Storyteller): Stories cannot tell all. The Stonecutter: I disagree. I think stories tell everything. 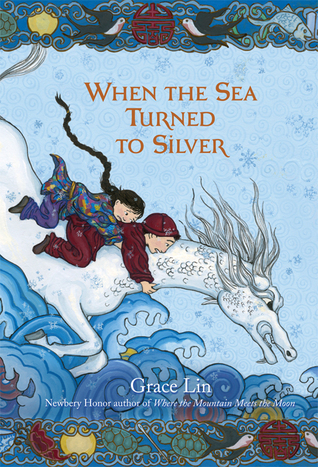 When the Sea Turned to Silver (2016) by Grace Lin was nominated for the National Book Award for Young People's Literature and I can definitely see why. This is a gorgeous book from the story itself to the beautifully drawn illustrations. Grace Lin uses stories from Chinese folklore and mythology and weaves them into the current narrative about Pinmei, her grandmother Amah, and her friend Yishan. When a new Emperor known as the Tiger Emperor comes to power he is supposed to make a journey up the mountain where Pinmei and her grandmother live. There he will consult with the spirit of the mountain. But this emperor doesn't make it to the top--perhaps he is too full of pride. Perhaps he is too intent on his all-encompassing plan to surround himself with the largest wall ever. So, the only things he takes with him from the mountain are all of the able-bodied men for slaves to build his wall. But he also takes Amah, the renowned Storyteller. Now what could an Emperor obsessed with walls want with a Storyteller? When Yishan challenges him and demands that the Emperor leave Amah alone, the Tiger Emperor tells him that he will let Amah go if the boy brings him the Luminous Stone That Lights the Night. Yishan and Pinmei have many adventures in their quest to find the Stone, most of which mirror or incorporate the many stories that Amah has told them over the years. They also meet many new friends who help them along their journey. Pinmei, who has always been shy, find her own voice to tell the stories that will lead the way and the bravery within to defeat the Tiger Emperor and set her grandmother free. This book is a beautiful story all on its own--the story of a young girl who finds her own voice and strength as she seeks to help her grandmother. It is also a beautiful blending of folklore and traditions to make a new and absorbing story. Written with great care for language and a luminous style well-suited to the myth and folklore used as a background for this lovely word tapestry. ★★★★ and a half. 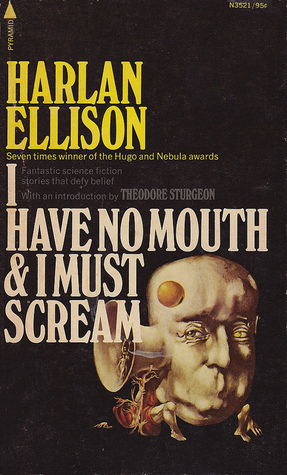 "I Have No Mouth & I Must Scream": When mankind builds supercomputers to do their fighting for them, they shouldn't be surprised that when the computer minds blend together and become sentient then it doesn't look to kindly on its creator. A cautionary tale about man's intentions backfiring on him. But also...a tale of sacrifice. The narrator gives up (and endures) quite a bit to save his companions. "Big Sam Was My Friend": Big Sam is especially gifted in the world of gifted circus performers. He's a teleporter who can move from place to place in the blink of an eye. He's on a search for his lost love...a search that will cost him just as much as the narrator of the titular story. "World of the Myth": Three space travelers are marooned on a plant inhabited by creatures with a hive mind. A mind that can reveal each traveler's true self to them. Can the traveler's survive once they know the truth about themselves? "Lonely Ache": Paul is visited by horrible nightmares--men are sent to kill him and he must kill or be killed. But the worst nightmare is the soft brown staring creature he believes is living in his room. Again...the projections of the inner self can be the most dangerous of all. "Delusion for a Dragon Slayer": Another cautionary tale that tells us that we all make our own heaven (or hell) when we die. But--having devised the perfect paradise we may forget that we're the ones who have to live up to it. "Pretty Maggie Moneyeyes": A man down to his last silver dollar finds the slot machine of every gambler's dreams--jackpots every time. But the final payout may not be quite what he planned. So...somehow, to my great embarrassment, until The Black Count: Glory, Revolution, Betrayal, and the Real Count of Monte Cristo by Tom Reiss came out I missed all the memos that would have told me that Alexandre Dumas, author of The Count of Monte Cristo (one of my favorite books, by the way), came from a mixed-race heritage. 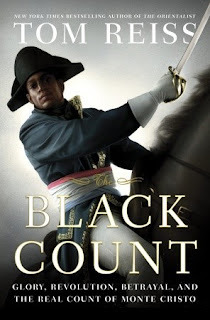 It was amazing to read the remarkable story of General Alex Dumas who rose from life as the son of a slave in Saint-Domingue (now Haiti) to the highest ranks in Napoleon's army. A man who was a fearless one-man fighting machine who led his men into battle, often wounding more of the enemy than his (at-first) own small band of Dragoons numbered. He never held back and directed his troops from behind, but rather led them into the fray. He was courageous and did not hold his life more dear than those of his men. And--when he had conquered, he refused to allow the bullying and pillaging that most armies indulge in after the battle. January is a rough month for me--so I'm either going to miss out on the Tuesday Night gatherings altogether or I am (as I am tonight) going to me late to the Tuesday Night Blogger's party each week. Most likely when I do pop in for a bit of tea and scones, it will be with an offering of a previous review. 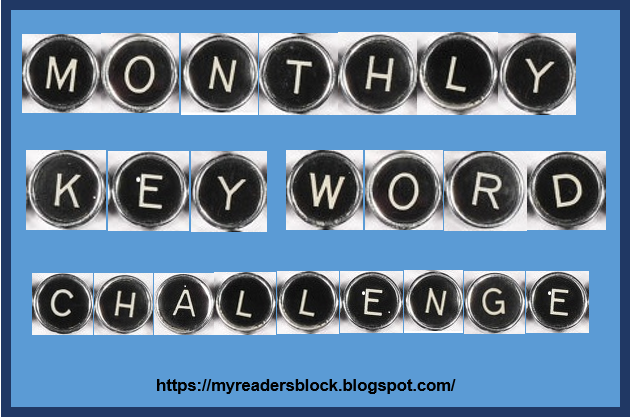 It is the start of a new year and with January being the first month, we at the Tuesday Night Bloggers (a group of eccentric eclectic crime fiction bloggers) decided to have firsts as this month’s theme. 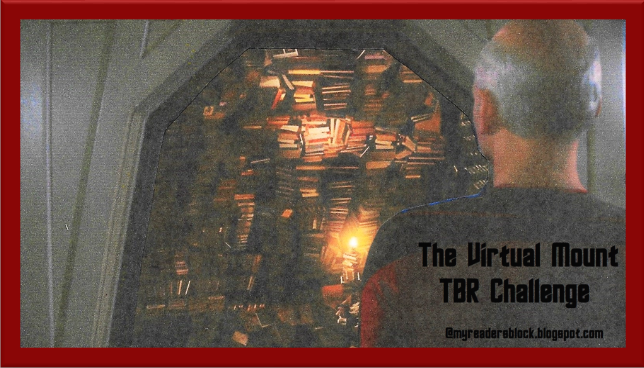 Such a theme is wide open to interpretation so over this month posts may be touching on first books by authors and first appearances of our favourite sleuths, as well as a host of other crime fiction firsts. 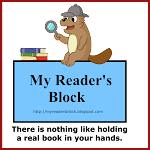 If you haven't already done so, you'll want to head over to Kate's and see what other "firsts" have been offered up this week and in the previous January gatherings. 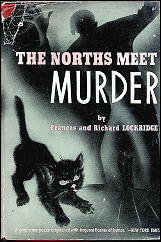 I decided that this week I would take us back to the beginnings our featured authors's detective career (in January's TNB logo at left) and give you all a peek at the very first Mr. and Mr North book by Frances and Richard Lockridge--The Norths Meet Murder (1940). 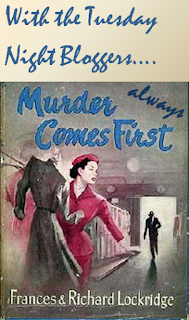 It is a lovely beginning to Frances & Richard Lockridge's series which features (to varying degrees) Pam and Jerry North as the slightly "screwy," yet classy amateur sleuth husband and wife team and the sharp Lieutenant (later Captain) Bill Weigand and his faithful, often confused sidekick Detective Aloysius Mullins. This first outing is a bit more police procedural than later installments and we spend a great deal of time following Weigand and Mullins around as they hunt down clues and interview suspects. Pam and Jerry appear at the beginning and end...as well as popping up now and again throughout, but this is really Weigand's book. The story opens with Jerry returning home from work in a rather grumpy mood to find that Pam has decided that they need to throw a party. And the empty apartment on the top floor of their building will be the perfect location "because there was so much room and she had just thought of it." She had already gone up earlier that day and checked out the space (just to be sure) and had cleared the idea with their landlady, Mrs. Buano. All she needs now is for Jerry to tell her what a fine idea it is and to go upstairs with her so she explain all the important details (like where they'll place the bar, for instance). Once he has downed enough cocktails, he is persuaded to go upstairs. But instead of visualizing the party arrangements and the expected guests, he and Pam find an unexpected guest already lounging in the bathtub. Naked. And very dead. "Six cars, every which way," Mrs. North called, excitedly. "They don't pay any attention to one-way streets. Seven cars, and there's going to be a crowd." It also brings Lieutenant Bill Weigand and Sergeant Mullins. It isn't long before the body is identified and it is discovered that the man moved within some of the same social circles as the Norths. Which gives them a bit of a motive--albeit tenuous. Weigand will sift the clues to find those that point to the true villain of the piece. It was a great delight to read this once again back in spring of 2016. 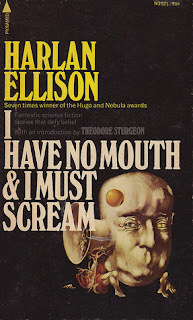 I first read it about twenty years ago or so--from the library. And have since gotten my very own copy. When a reading challenge called for a book that involved a party, I decided it was time to revisit my friends, the Norths. The book is a lot of fun. The dialogue and the descriptions are breezy and delightful. Pam's apparent non sequiturs keep Jerry, Weigand, and Mullins on their toes. This time around, I was struck by how much I love Mullins and his distrust of screwy murders and even screwier witnesses. I was also struck by the racism in Mullins's treatment of a Japanese servant. I hadn't remembered that from the first reading. I'm convinced that it had a great deal to do with the fact that this book came out during World War II and I hope I'm remembering correctly that there is little of it in later books. The police procedural nature of the book is decent--although the clues are not quite fair play. There is an interesting alibi involved and the wrap-up has a medium-sized dose of female in jeopardy when Pam realizes who the murderer must be and s/he realizes that Pam has had a "light bulb" moment. Overall, great fun and light entertainment at its best. I originally gave this five stars. This time round, I'm giving it ★★★★ and a half--with a small deduction for the small amount of racism.